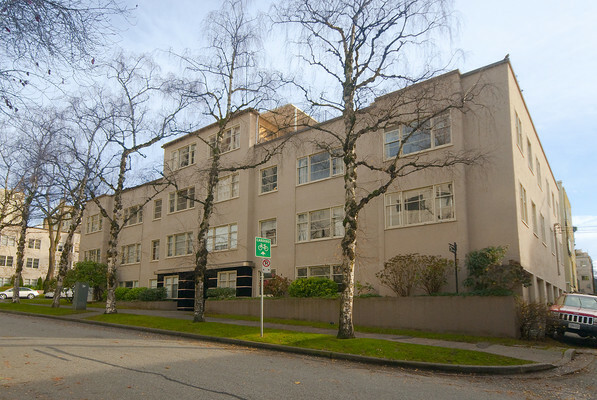 Building Highlights: ﻿﻿﻿﻿Space and charm in well maintained character deco style 20 unit coop 'walk-up' steps to English Bay Seawall, Alexandra Park, Davie/Denman shops and services. Solid, efficiently maintained building offers economical home. Supreme location! Close to English Bay & shopping on lower Davie & Denman. Located on quiet residential street. Two blocks to the seawall, two minutes to beach and one minute to Starbucks & shops! Several off the orginal windows have been repaired or re constructed to the orginal, as when the building was built along with the orginal curved, all wood stairways and black onyx entryway. Other notes: Any pet or rental only w/board approval. Subject for board approval.